Anxiety and pain are two of the main obstacles to the acceptance of dental care. Appropriate administration and use of Nitrous Oxide/Oxygen can be a safe, effective means to alleviate mild to moderate fear and anxiety. In addition, it may diminish responses to pain and elevate pain threshold. This course will provide an introduction to the pharmacology, mechanism of action and effects of Nitrous Oxide/Oxygen. The goals of anxiolysis, including clinical applications, indications, advantages/disadvantages and biohazards of administration will be presented. The monitoring and recognition of potential complications will be discussed. 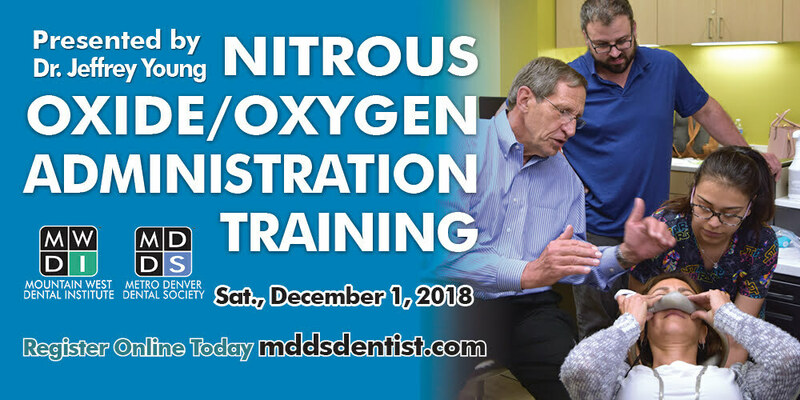 A review of Nitrous Oxide/Oxygen equipment and technique for safe administration will be presented followed by a demonstration of the administration and use of Nitrous Oxide/Oxygen inhalation equipment in a dental clinic setting. Participants will then practice administration and monitoring using actual inhalation equipment. This is a one-day course with approximately five (5) hours of classroom instruction followed by two (2) hours of clinical demonstration and practice. At the end of this course, participants will clearly understand the indications for use of Nitrous Oxide/Oxygen and be able to provide safe administration and monitoring. Dr. Jeffrey Young earned his DDS from the University of Iowa and is a retired Army Colonel. He is a former Associate Professor at the University of Colorado School of Dental Medicine and served as Director of the Sedation Program at Children’s Hospital Colorado, Pediatric Dental Residency Program. He currently owns a private pediatric dental practice in Brush, CO.